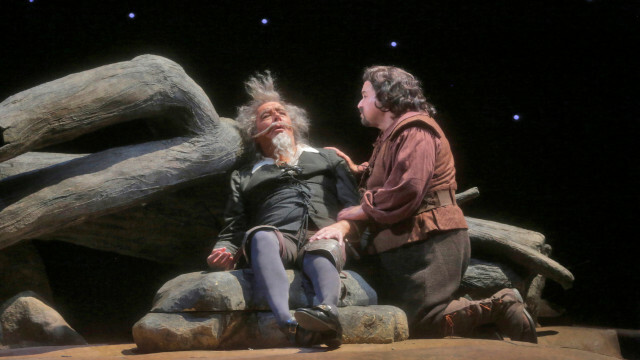 Bass Ferruccio Furlanetto is Don Quixote and bass-baritone Eduardo Chama is Sancho Panza in San Diego Opera's "Don Quixote." 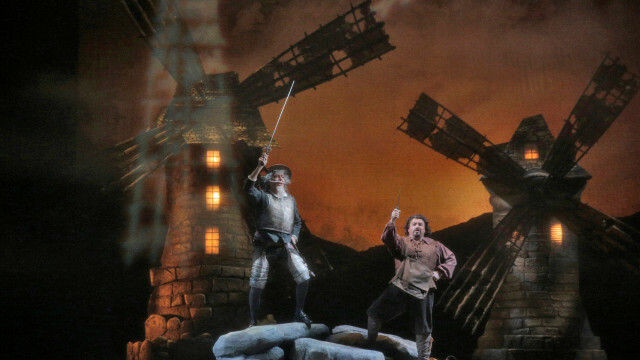 Bass Ferruccio Furlanetto is Don Quixote and bass baritone Eduardo Chama is Sancho Panza in San Diego Opera's "Don Quixote." At the opening night of Massenet’s “Don Quixote,” possibly the San Diego Opera’s final production, it was hard not to hum ‘The Impossible Dream.’ Given the financial constraints the company complained of when ringing its own death knell a few weeks ago, it was difficult not to feel that 70 people onstage, with multiple, elaborate sets, is extreme and excessive, a flagrant case of conspicuous over-consumption in post-recession times. Why so large a chorus? Why so large a house, for that matter? Is it really necessary for the Opera to try to fill a 3,000-seat theater? Or have such spacious and sumptuous offices? Those topics will, hopefully, be discussed during the two-week shutdown postponement — an absurdly small window in which to turn this floundering ship around. But these thoughts are clearly on the minds of many San Diegans. Before the curtain rose, when general director Ian Campbell took the stage for his usual pre-performance welcome, he was greeted with jeers and boos. If there were tomatoes to be thrown, they would have been. The board dutifully stood, in solidarity and support, but there are now rifts within their ranks, too, and anyway, their backing couldn’t drown out the vociferous calls to “Resign!” It was sad, really, since, in his hubris and narcissism, Campbell seemed to think the unruly response was addressed to the artists and the performance. No, it was just for him. He who had brought the Opera to such heights by embracing change, is now the one most resistant to it. In what seemed to be a valedictory, he became the embodiment of the doomed Don of the opera: self-deluded and unwilling to see the reality of the world around him. All that prologue was forgotten once the music began. Resident conductor Karen Keltner, a lifelong Francophile and specialist in French music, took commanding lead of the symphony musicians and teased all the beauty and nuance from the score. But the evening belonged to Feruccio Furlanetto, the towering bass who has mastered the look, the feel, the stature and of course, the rich, glorious voice of The Knight of the Woeful Countenance. Furlanetto is a San Diego favorite, who successfully assayed this role in 2009 (the opera was first performed locally in 1969). Once again, Eduardo Chama plays the sidekick, loyal squire Sancho Panza. Chama’s dramatic and comedic chops are in full flower, though his baritone is more robust than his bass. Then there’s the Don’s damsel-in-no-distress: Dulcinea, winningly sung by German mezzo –soprano Anke Vondung. The opera is unique in having the three principals in the lower registers, which brings a dark, mellow richness to the music. In this version of the Cervantes 1615 classic, first performed in 1910, Dulcinea is no country girl; she’s a wealthy flirt, the darling of her hometown who toys with many men’s affections. This characterization waters down her supposed final-act transformation. In fact, in a story that’s all about drama and adventure, the opera feels rather static, though the Flamenco dances (choreographed by Kristina Cobarrubia) add color and energy. This is a rather Christian take on the tale, with Don Quixote serving as benevolent, tortured Christ figure, an interpretation (with support from the libretto by Henri Cain) that gives director Keturah Stickann opportunity for some gorgeous stage pictures. The scenic (Ralph Funicello) and lighting (Marie Barrett) designs complement the melancholic tone of the music. But it eludes me why scene changes, nearly instantaneous in every theater in town (including the Civic, when Broadway San Diego is in residence), stop the action for 10 or more minutes during the opera, forcing the spectators to sit and wait in semi-darkness. Overall, this was a very satisfying evening. The vocal performances were outstanding. And the audience made its voice heard, too. “Don Quixote” plays through April 13, at the Civic Theatre downtown. Performances are Tuesday and Friday at 7 p.m. and Sunday at 2 p.m.